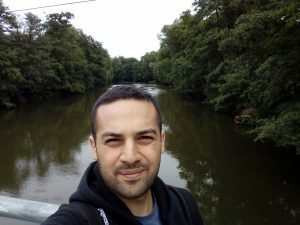 Mehmet Aziz Yirik is a scientific researcher (PhD student) at the Friedrich-Schiller University Jena, Germany. He was born in Istanbul, Turkey. He has received his bachelor degree from the mathematics department of Mimar Sinan Fine Arts University, Istanbul. As the final project of the bachelor degree, he worked on symmetry group calculations for Archimedean and Platonic solids under the advisement of Prof. Dr. Ayse Berkman. For this project, first he studied symmetry groups in mathematics and their applications in arts such as geometric patterns of Alhambra Palace, Spain. As one of his hobbies, he was the founder and organizer of “Science and Arts Workshops” at Mimar Sinan Fine Arts University. After completing the bachelor degree, Aziz moved to the UK for short term where he also took two applied mathematics courses; ring theory and differential geometry, at the University of Sussex. After moving back to Istanbul, he applied to a master program called ” Computational Sciences and Engineering” at Bogazici University, Istanbul. During his thesis, Aziz worked on a data collection tool for ligand centric protein interaction data. He also worked on the ligand centric network model of sphingolipid metabolism playing crucial roles in the treatment of cancer and neurodegenerative disorders. After completing his master degree in Bogazici University, Aziz moved to Jena (2017) to work as a member of Prof. Steinbeck’s research group. As the member of the team, he works on mathematical cheminformatics and its applications to contribute to the team with his mathematics and bio-cheminformatics background. Besides his academic career, Aziz also loves different type of arts such as designing, filming, and a lot more. He worked for Istanbul Design Center when he was a bachelor student. He worked for a project about geometric patterns and their analysis, which was also part of his bachelor final project. He is also a producer of a documentary about Assyrian people living a city called Mardin, Turkey. The documentary is called Mountain of Servants and received many awards from American and European film festivals. The film was screened also at Embassy of France, Washington.